There is no surefire way to attain success, only the steps that propel you closer to that goal. Enthusiasm and determination may take you far, but certainly not all the way. You cannot allow external forces to shape your prospects either or let the chips fall where they may. To avoid making every mistake in the book, get your priorities straight, and plan ahead of time. Using these tips, you should be able to navigate the dynamic and competitive environment and keep your company out of the water. Your goals are the driving force behind your entrepreneurial endeavors. However, you need something more specific as a guiding light than simply “becoming a successful entrepreneur”. Business career is not the way to overcompensate for something or just make as much money as possible. You need to feel drawn to the business idea and ignite the passion within to use it as a fuel for the long race. The ultimate trick, of course, is to also find a way to translate your dreams and visions into reality. Building connections and relationships is paramount to gaining prominence. It has never been more important to hone your social, communication, and soft skills in general. They help you foster an open and positive culture within the company, land more deals, attract investors, and make your business flourish. Strike a fine balance between formal and professional on the one hand, and relaxed and loosened on the other. Know how to empathize and bond with others on a deeper level to build trust. A lot of people underline the importance of being organized, but what does that mean in practice? Well, the rules of sound organization and management should apply to everything from email inboxes to office supplies. Companies like DymoOnline offer a variety of tools for easy identification and labeling, so make good use of them. Moreover, deal with digital clutter and make your life easier. Get into the art of time management and create daily, weekly, and monthly schedules. Sometimes, the best way to promote your business is to focus on promoting yourself. Establish a strong social media presence and reach out to industry experts and influencers. Try to figure out your market position as a brand, carve out a niche, and obtain a rock-solid reputation. Always provide content, insights, and commentary around your expertise. The objective is to become a go-to person and witness your business prospering from your strong personal brand. Technology empowers modern businesses and enables entrepreneurs to take efficiency to the next level. Thus, make sure to tool up and assemble a killer business arsenal of collaboration, finance, accounting, time management, communication, and other platforms. Stay in tune with goings-on regardless of where you are, and take every opportunity to boost the productivity of teams and individual members. Tech adoption and seamless implementation is the name of the game. Many businessmen are leery of delegating tasks, afraid to relinquish control and authority. This is, however, a grave mistake because you cannot hope to effectively handle or micromanage everything by yourself. 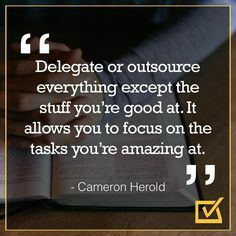 By delegating, you allocate resources optimally and free up time to tackle core aspects of running a business. Along similar lines, it often makes sense to outsource some jobs and projects instead of hiring full-time workers or bothering with it yourself. To make strides towards success, you have to avoid the many pitfalls and overcome a slew of challenges. Pick up lessons from those who have learned them the hard way: rely on tried and tested tips that have already helped many entrepreneurs get their operations off the ground. Get your personal brand working for you and make the most of the tech tools. Employ the best business practices and maximize resources at your disposal. Stop at nothing to get ahead of the pack and fulfill your entrepreneurial dreams.